Welcome to the world of electronic product development in Altium's world-class electronic design software. This tutorial will help you get started by taking you through the entire process of designing a simple PCB - from idea to outputs files. 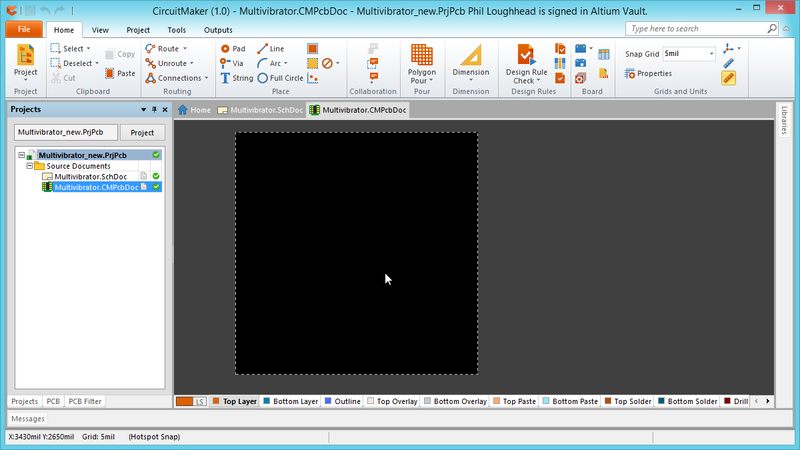 If you are new to Altium software then it is worth reading the article Exploring CircuitMaker to learn more about the interface, information on how to use panels, and an overview of managing design documents. The vertical bar is used as a separator for ribbon references, in the form MainRibbonTab | RibbonGroup | ButtonName. As shown in the image below, an example would be View | System | Start, click on the View tab, look in the System group, click on the Start button. The double-arrow is used as a separator for menu references, in the form MainEntry » SubMenu » MenuCommand. As shown in the image below, an example would be File » Help » About, click on the File menu button, select the Help entry to open that sub-menu, then select the About menu entry. Note that ribbon buttons and menus can also be combined, in this situation these notations are used together. CircuitMaker is a community-based PCB design tool, where PCB design projects are made available to everyone in the design community. To achieve this, CircuitMaker designs are stored in the cloud, in a free, community storage Vault. Using the Community Vault is completely transparent, as a designer you browse, create, open and save projects and project documents that are stored in the Vault, from within CircuitMaker. PCB projects stored in the Community Vault are available to everyone in the CircuitMaker community. OK, you're ready to begin capturing the design. The first step is to create a PCB project. a public project stored in the CircuitMaker Community Vault. You remain the owner of a public project, others can open and view it, but cannot edit and save changes to your design until you configure them as Team members. a private project stored on your PC. CircuitMaker supports 2 private projects, which are stored in your own Sandbox. You can develop the project in the Sandbox until you're ready to release it to the broader CircuitMaker community. The first step is to create a new project. For the tutorial, it makes sense to keep this in your Sandbox, as it is simply a learning exercise. A new project is created in the Tasks list of the Home view, or by selecting File » New Project from the menus. Once the project has been created you can open it and add a schematic and a PCB file to it. Create the new project in the required location (hover to highlight). Click New Project in the Task list, or select File » New Project » PCB Project from the menus - the Community page will open, ready to enter the project Name and Description. Click in the Name field, and enter the project name, Multivibrator. Select Sandbox if you prefer to keep this project private. 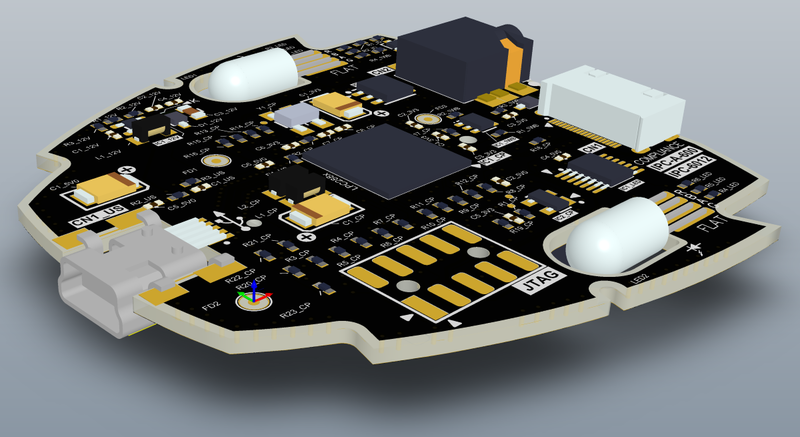 When a project is set to Public it is available to all designers in the CircuitMaker community. Note that you can only keep 2 projects in your Sandbox. In the Description field, type in a description of the new project. Click Save to create the project file, it will be saved into the Community Vault. The new project has now been created in the Community Vault, the next step is to open it locally in your installation of CircuitMaker. After creating a new project CircuitMaker will automatically show that project in the Community Vault, ready to be opened. Click Open to download the project from the Community Vault (hover to highlight). After creating a new project CircuitMaker will automatically show that project in the Community Vault, ready to be opened. If it is not displayed as shown in the image above, click Open Project in the Task list, to list the Featured projects. Click on My Projects in the main area of the Home view to list only your own projects, then click on the Multivibrator project - the software should now look like the image above. Click Open to open the project file in CircuitMaker. This downloads the file from the Community Vault and opens it in CircuitMaker. The new project will appear in the Projects panel. If this panel is not displayed, enable it via the View | System | Projects button in the ribbon. Once the project has been opened, it will display in the Projects panel. 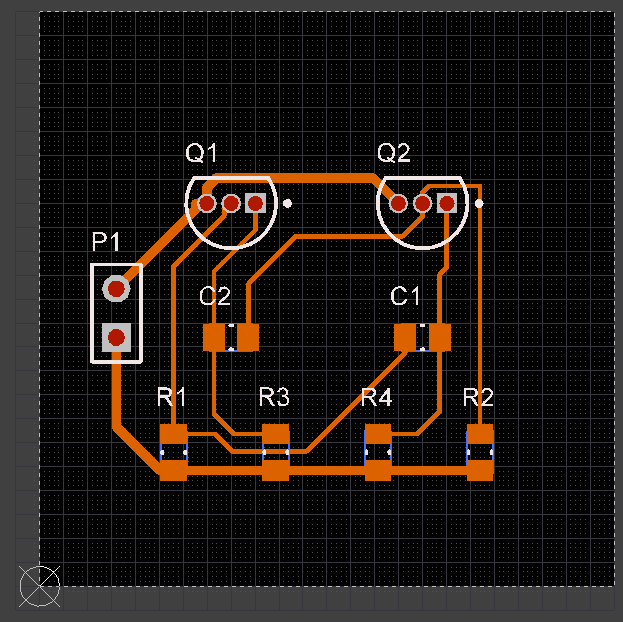 The new project, open in CircuitMaker, ready to add the design files. Add a schematic sheet to the project, then name it, and it will appear in the project tree. When the blank schematic sheet opens you will notice that the workspace changes. The Ribbon will include a range of new buttons, and new panels may be displayed. You are now in the Schematic Editor. On the ribbon, click the Home | Project | Project » Add New Schematic menu entry. The Enter file name dialog will appear, enter the name Multivibrator and click OK.
A new, blank schematic sheet will open and an icon for this schematic will appear linked to the project in the Projects panel, under the Source Documents folder icon, as shown in the image above. When you add the new schematic to the project the schematic sheet opens. When it does, editor-specific panels might also open, such as the SCH Inspector panel. Panels are used extensively in CircuitMaker, each providing specific viewing or editing abilities. For example, the Inspector panels allow you to edit the properties of the currently selected objects, it might be 1 object or it might be 100, all in a single edit action! To hide a panel click the button at the top right of the panel. Note that if there are multiple panels stacked on top of each other and the stack is pinned open, then clicking the button will close them all. In this case you can right-click on the panel name and select the Close command from the menu that appears, to close just that panel. To display a panel, click on its button in the View tab. Control the display of panels in the View tab. The last step is to save the modified project and the schematic back into the Community Vault, which can be done via the Projects panel right-click menu. Commit the project to save new and modified files and push them into the Community Vault. To save the new schematic sheet and the modified project file back into the Community Vault, the easiest way is to Commit the project. If you're not familiar with version control systems (VCS), the term commit means to save and push a copy of the files into the storage repository used by the VCS, in this case the Community Vault. In the Projects panel, right-click on the project filename and select Commit Project. The Commit dialog will open, indicating that the schematic needs to be saved and added (commited), and the project file is also modified and needs to be commited. Enter a Comment if required, and click OK. The new project with a schematic - ready to start designing! When you start up CircuitMaker tomorrow and want to re-open your project, click Open Project in the Tasks list, then look for My Projects. Locate the project you are after and click to display it, then click Open to load it into the Projects panel. You're ready to start the design process, so double-click to open the Multivibrator schematic. Before you start drawing your circuit, is is worth setting up the appropriate document options, including the Sheet Size, and the Snap and Visible grids. Environment options, such as the cursor type, grid color, selection color and auto pan behavior are configured in the Preferences dialog (File » System Preferences). For this tutorial, the only change that needs to be made is to set the sheet size to A4, this is done in the Standard Style field of the Sheet Options tab of the dialog. Components are the basic building-blocks of circuit design. The real-world component that ultimately gets mounted on the board is represented as a schematic symbol during design capture, and as a PCB footprint for board design. In the CircuitMaker design space, you can think of the component as a package, bringing together the schematic model (the symbol), the PCB model (the footprint), and the parameters that detail the component, such as the supplier part number, tolerance, wattage, and so on. These components are stored in the cloud in the CircuitMaker Community Vault, and are available to all designers in the CircuitMaker community. To simplify the process of designing in CircuitMaker, CircuitMaker is tightly coupled to the online Octopart component database. Octopart is a search engine for electronic components, providing an easy-to-use search interface that connects to literally tens of millions of components, supplied through a large number of component suppliers, including Allied, Avnet, Digi-key, Element 14, Farnell, Newark, Mouser, amongst others. By coupling CircuitMaker components to the Octopart components, your components are manufacturing ready - when it is time to generate a BOM, all of the components will include full supply chain details. The design component you create in CircuitMaker is linked to the physical Octopart component by a unique identifier. Octopart is an online electronic component search engine. Components are accessed through the Octopart Online Search Engine, which provides instant access to information, including real time pricing and availability from a range of authorized and non-authorized dealers and distributors. Documentation, including datasheets and application notes can be accessed, with direct links to supplier websites. The Octopart Component has no Models, what do I do? When you browse through the Octopart components in the Libraries panel, you will notice that most of the components include a small icon at the top left of the component image. This icon indicates that this component is also linked to a suitable design component in the CircuitMaker Community Vault, which has symbol and footprint models, so is ready to use in your design. If the Octopart component does not have models (there is no icon displayed), it means that there is no design component stored in the CircuitMaker Community Vault for that Octopart component. 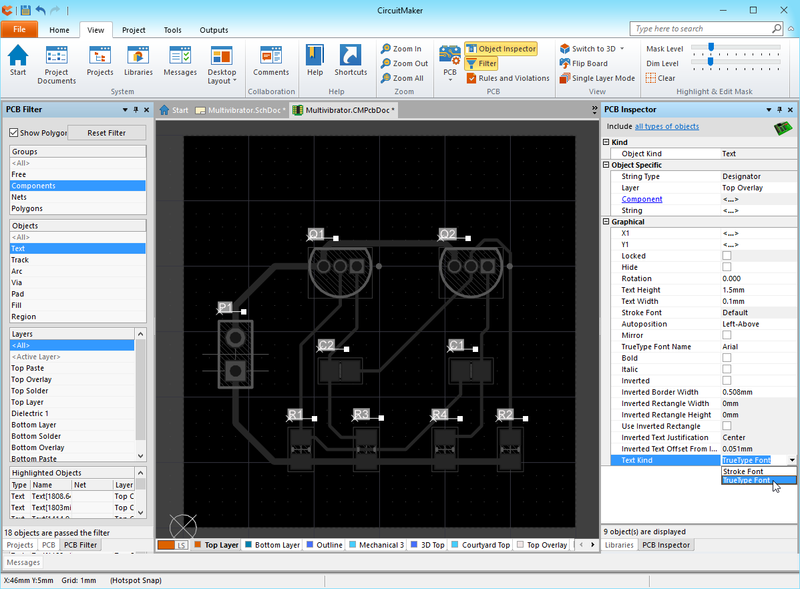 Any CircuitMaker designer can create a suitable CircuitMaker design component for an Octopart component, which will then be available to all designers in the CircuitMaker community. You are also free to make a new version of any design component, if the existing version is not suitable for your requirements. To create a new design component for an Octopart component that has no models, click the button, or right-click on the Octopart part in the Libraries panel and select Build This Component. To create a new version of an existing design component (with new models), click the button, or right-click on the Octopart part in the Libraries panel and select Build New Version. To edit an existing version, for example to correct a mistake in a model, right-click on the Octopart part in the Libraries panel and select Edit. To create a custom component (one that is not available in Octopart), click the Build your own link down the bottom of the Libraries panel. To access your custom components you set the Libraries panel to Favorites mode, use the dropdown at the top of the panel to do this. When you run one of these commands a component template is opened in a CircuitMaker, where parameters and symbol and footprint models are added and edited. To learn more about creating a design component, refer to the Component Management in CircuitMaker article. Components are accessed through the Libraries panel (View | System | Libraries). At the top of the panel you can select between the Octopart library and your Favorites library. Components are accessed through the Libraries panel. Favorites is simply a list of components that you have: already used in a design; nominated to be included in your Favorites library by running the right-click » Add to Favorites Library command, or is a custom component that you have created. After switching the Libraries panel to Favorites you may need to refresh the list to see recent additions, right click in the component list and select Refresh Library. 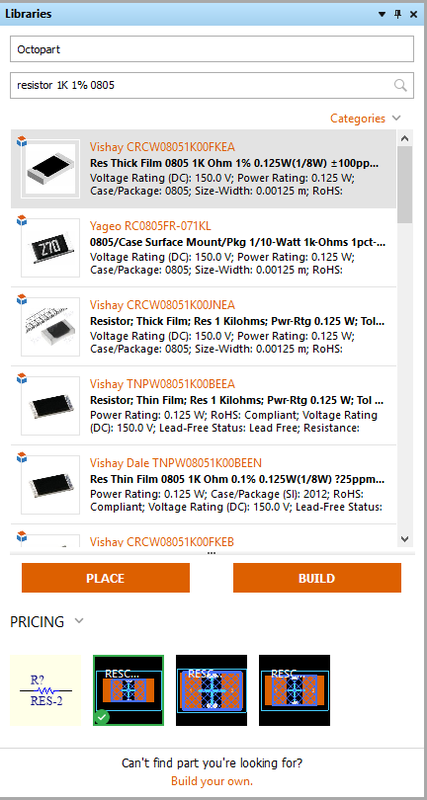 To help you find the component you need, CircuitMaker includes powerful component searching capabilities. Searching is performed from the search box at the top of the Libraries panel. The software will initially return the first 200 hits, to improve the search results enter as much information as possible into the search string. Scroll to the bottom of the search results list to load the next 200 hits, repeat to load the next 200 hits, and so on. The Search returns all components that match, those that include CircuitMaker models are listed first. Look for the icon at the top left of the component image to quickly identify components that already have CircuitMaker models. The component name shown in orange is a link, click this to open the Octopart site with this part loaded. Hover over the component description for a detailed list of the component's properties. Shortly you will search for the following components to use in the Multivibrator circuit. Note that you can copy the search string directly from the comments field on this web page and paste it into the Search field in CircuitMaker's Libraries panel. You might also find alternate components in Octopart that are suitable - this is fine since this tutorial is about learning the process, not meeting specific design requirements. Before you start searching and placing, read the following section to learn how to configure the component properties before placement. Right-click » Place - right-click on the component and select Place from the menu, the component appears floating on the cursor, position it and click to place. Note that there may be a brief delay while the component is downloaded from the cloud. Press Spacebar to rotate the component anti-clockwise, in 90 degree increments. Press X to flip the component along the X-axis, press Y to flip it along the Y-axis. If you are ready to start finding and placing the components, please do so. If you need more information, use the step-by-step instructions in the collapsible sections below. All the components placed, ready for wiring. With the Libraries panel set to Octopart, search for BC547 NPN transistor TO-92. Locate a suitable component in the search results that has a symbol and footprint, for example the ON Semiconductor BC547CG transistor. Select the transistor in the panel and click the button. The cursor will change to a cross hair and you will have an image of the transistor floating on your cursor. Note that there might be a slight delay as the component downloads from the cloud. You are now in part placement mode. If you move the cursor around, the transistor will move with it. Set the Designator to Q1. Once you are happy with the transistor's position, left mouse click or press Enter on the keyboard to place the transistor onto the schematic. Don't worry too much about the location, you can easily change this in a minute. Move the cursor and you will find that a copy of the transistor has been placed on the schematic sheet, but you are still in part placement mode with the part outline floating on the cursor. This feature allows you to place multiple parts of the same type. Now to place the second transistor. This transistor is the same as the previous one, and since the software automatically increments the component designator when you place multiple instances of the same part there is no need to edit its attributes before you place it. You just need to orient the second transistor. Once you have decided on a location for the part, left mouse click or press Enter to place Q2. Once again a copy of the transistor you are "holding" will be placed on the schematic, and the next transistor will be floating on the cursor ready to be placed. With the Libraries panel set to Octopart, search for resistor 100K 1% 0805. Locate a suitable component in the search results that has a symbol and footprint, such as the Vishay CRCW0805100KFKEA. Note that in the model preview area there are multiple footprints available, these are the IPC standard N (Nominal), M (Most) and L (Least) resistor land patterns. For this tutorial leave it at the default. Click on the dropdown arrow of the Comment field and select ="Resistance". If necessary, press the Spacebar to rotate the component in 90° increments, until it has the correct orientation. The remaining two resistors, R3 and R4, have a value of 1K, in the Libraries panel search for resistor 1K 1% 0805. Locate a suitable component in the search results that has a symbol and footprint, such as the Vishay CRCW08051K00FKEA. Using the steps just given, set the Designator to R3, and set the Comment field to =Resistance. With the Libraries panel set to Octopart, search for capacitor 22nF 16V 0805. Locate a suitable component in the search results that has a symbol and footprint, such as the Kemet C0805C223K4RACTU. While the capacitor is still floating on the cursor, press the Tab key to open the Component Properties dialog. Click on the dropdown arrow of the Comment field and select =Capacitance. Position the capacitor above the transistors but below the resistors (refer to the schematic diagram shown earlier) and click the Left Mouse Button or press Enter to place the first capacitor. Now position and place capacitor C2. With the Libraries panel set to Octopart, search for header 2 way through hole 0.1 in vertical male. Locate a suitable component in the search results that has a symbol and footprint, such as the Molex 90120-0762. While it is floating on the cursor, press Tab to edit the attributes and set Designator to P1. In the Comment field, replace the contents with the string Header 2. Before placing the connector, press X to flip it horizontally so that it has the correct orientation. Click to place the connector on the schematic, as shown in the image above. The grids you cycle through when you press the G shortcut are defined in the Schematic - Grids page of the Preferences dialog (File » System Preferences). On the Schematic - General page of the Preferences dialog there are settings to select the type of units that will be used, select between Imperial or Metric. Note that Altium components are designed using the DXP Defaults imperial grid, if you change to a metric grid the component pins will no longer fall onto a grid of 10 - if you choose to use a metric grid you will need new component symbols with pins placed on this metric grid! To make sure you have a good view of the schematic sheet, press the PgUp key to zoom in or PgDn to zoom out. Alternatively, hold down the Ctrl key and roll the mouse wheel to zoom in/out, or hold Ctrl + Right Mouse button down and drag the mouse up/down to zoom in/out. There are also a number of useful View commands in the right-click » View submenu, such as Fit All Objects (Ctrl+PgDn). Firstly, wire the lower pin of resistor R1 to the base of transistor Q1 in the following manner. Click the button (Home | Circuit Elements | Wire) to enter wire placement mode (or right-click and select Place » Wire). The cursor will change to a cross hair. Note that the cursor remains a cross hair, indicating that you are ready to place another wire. To exit placement mode completely and go back to the arrow cursor, you would Right-Click or press ESC again - but don't do this yet. If you prefer to show wiring cross-overs as a small bridge , enable the Display Cross-Overs option in the Schematic - General page of the Preferences dialog. The electrical hotspot of a net label is the bottom left corner, place the net label so that the bottom left corner touches the upper most wire on the schematic, as shown in the image below. The cursor will change to a red cross when the net label is correctly positioned to connect to the wire. If the cross is light grey, it means there will not be a valid connection made. Ports are used to create connectivity between 2 separate points on different sheets. Offsheet connectors can also be used to do this, but ports offer more connectivity and presentation options. 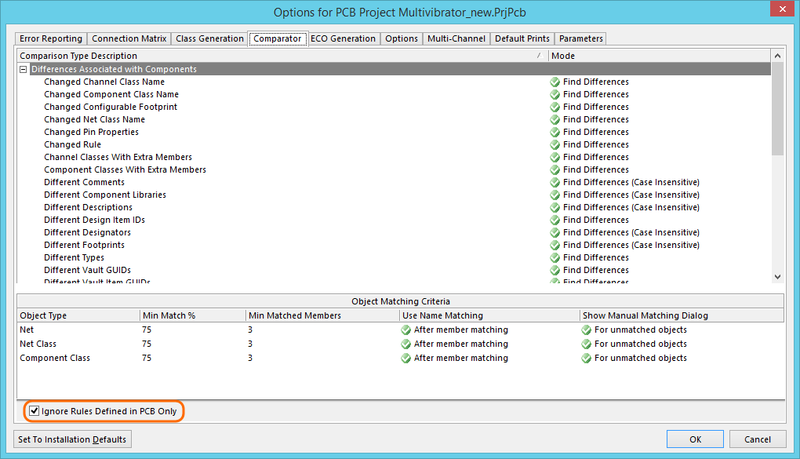 Project-specific settings are configured in the Options for PCB Project dialog, shown below (Home | Project | Project » Options). The project options include the error checking parameters, a connectivity matrix, Class Generator, the Comparator setup, ECO generation, output paths and netlist options, Multi-Channel naming formats, Default Print setups, Search Paths, and project-level Parameters. These settings are used when you compile the project. Project outputs, such as assembly, fabrication outputs and reports are set up from the Outputs tab of the Ribbon. These settings are also stored in the Project file so they are always available for this project. See the Documentation Outputs section for more information. After you complete the schematic in CircuitMaker, you compile it. This generates an internal connectivity map of the design, detailing all of the components and nets. When the project is compiled, comprehensive design and electrical rules are also applied to verify the design. 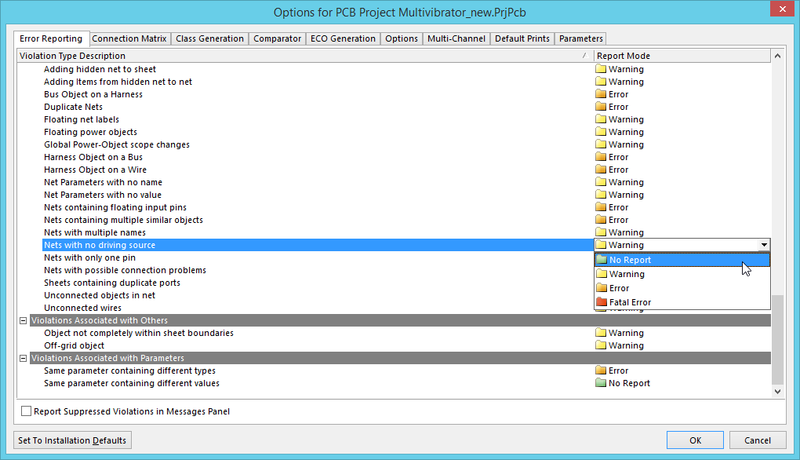 The design and rule checks that are applied are configured in the Options for PCB Project dialog, shown above. Schematic diagrams are more than just simple drawings - they contain electrical connectivity information about the circuit. You can use this connective-awareness to verify your design. When you compile a project, the software checks for errors according to the rules set up in the Error Reporting and Connection Matrix tabs of the Options for Project dialog. When you compile the project any violations that are detected will display in the Messages panel. To compile the project and check for errors, select Home | Project | Project » Compile. To check that there are no longer any errors, recompile the project (Home | Project | Project » Compile) - the Messages panel should show no errors. Save the schematic and the project file (File » Save All), then Commit the changes into the Community Vault (Home | Project | Project » Commit Project). The schematic zooms to present the object in error. How close you zoom in is defined by the Zoom Precision, set in the System - General Settings page of the Preferences dialog. After selecting this command the Enter File Name dialog will appear, enter the name Multivibrator and click OK. Note that you do not need to enter the file extension, this is automatically added by CircuitMaker. The PCB will appear as a Source Document in the Project, as shown in the image above. Note that at this stage it will have a small blue cross next to the name, indicating that it exists locally, but is not yet stored in the Community Vault. Adding the PCB has changed the project, so save the project too. To do this you can right-click on the project filename in the Projects panel, and select Save Project, or select Home | Project | Project » Save Project. The last step is to save the new PCB and modified project file into the Community Vault. To do this select Home | Project | Project » Commit Project. The Commit dialog will appear, enter a comment and click OK to save your work into the Vault. Performing a Commit saves modified and new files into the Community Vault. Your project should now look like the image above this collapsible section, with a green tick next to each file. Switch board shape editing mode to redefine the board shape, note the editing cursor (right image) that appears when you are in a location where you can click and hold to resize. The objective is to resize the shape to create a 30mm by 30mm board. The Coarse visible grid is 25mm (5x the snap grid), and the Fine visible grid is 5mm - the Coarse grid will be used as a guide. You can now either: slide the upper and right edges down and in to create the correct size; or move 3 of the corners in, leaving the one that is at the origin in its current location. When the board has been resized, click anywhere in the workspace to drop out of board shape editing mode. Now set the snap grid to 1mm, ready for the next phase of the board design process. Click the button in the CircuitMaker title bar to save the board. A good approach to defining the shape of the board is to draw it by placing a series of tracks (and arcs for curved boards) on the keepout layer. As well as being useful as a placement and routing keep-away barrier, these tracks and arcs can be selected (Home | Clipboard | Select » All on Layer) and used to create the board shape using the Home | Board | Board Shape » Define from Selected Objects command. The process of transferring a design from the capture stage to the board layout stage is launched by pushing the changes from the schematic editor (select Home | Project | Project » Update PCB Document Multivibrator.CMPcbDoc on the Schematic editor Ribbon), or by pulling the changes from the PCB editor (select Home | Project | Project » Import Changes from Multivibrator.PrjPcb on the PCB editor Ribbon). List all components used in the design, and the footprint required for each. When the ECOs are executed the software will attempt to locate each footprint in the Community Vault, and place each into the PCB workspace. If the footprint is not available, an error will occur. 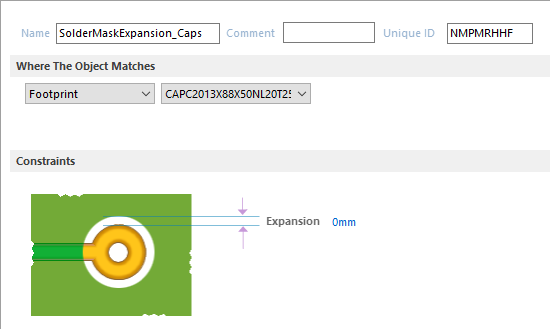 If enabled, additional design data is then transferred, such as net and component classes. Have the schematic document, Multivibrator.SchDoc as the active document in CircuitMaker. Select Home | Project | Project » Update PCB Document Multivibrator.CMPcbDoc from the Ribbon. The project will compile and the Engineering Change Order dialog open. Click on Validate Changes. If all changes are validated, a green tick will appear next to each change in the Status list, as shown in the image below. If the changes are not validated, close the dialog, check the Messages panel and resolve any errors. 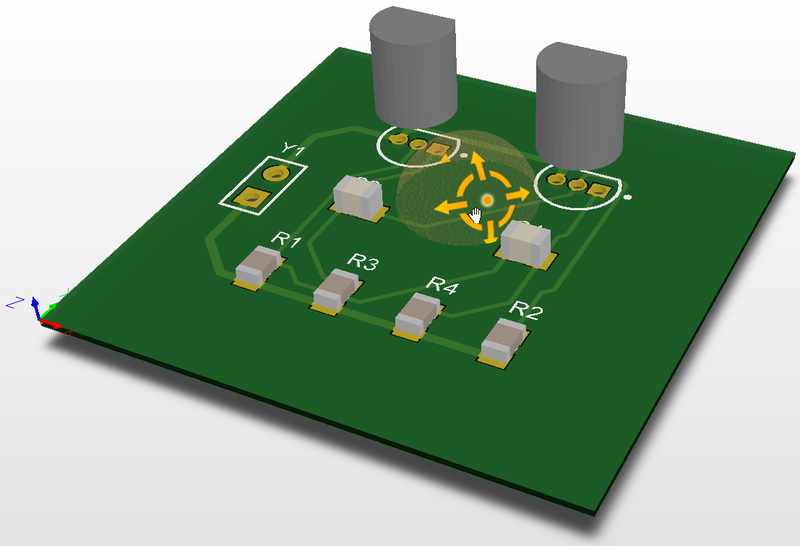 The ECOs have been executed correctly, close the dialog and the components will be outside the board shape. The components will have been positioned outside of the board, ready be positioned on the board. There are a few steps to complete first though, such as configuring the placement grid, the layers and the design rules. Once all of the ECOs have been executed the components and nets will appear in the PCB workspace, just to the right of the board outline, as shown in the CircuitMaker image above. How each type of object is displayed (solid, draft or hidden), in the Show/Hide tab of the dialog - these options can be handy for hiding objects you are not interested in, for example 3D Body objects while in 2D mode. 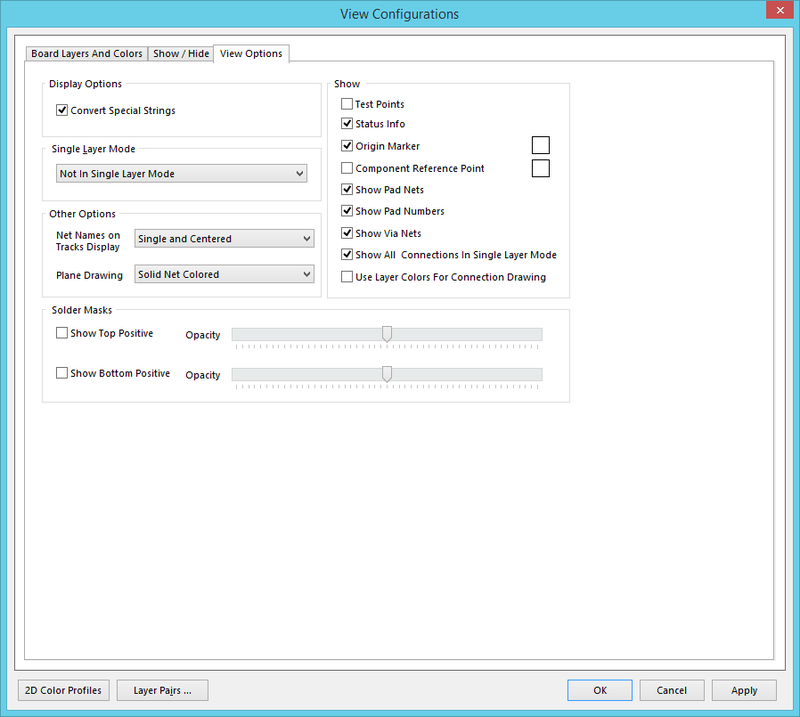 Configure other view options, such as the display of net names on pads and tracks, and how Special Strings are displayed. As well as the signal and power plane (solid copper) layers, the PCB Editor also includes soldermask and silkscreen physical layers - these are all fabricated to make the physical board. The arrangement of these fabricated layers is referred to as the Layer Stack. The layer stack is configured in the Layer Stack Manager, click Home | Board | Layer Stack Manager to open the dialog. Define the component orientation for that layer (advanced feature available in Altium products that support rigid-flex and embedded components). When you have finished exploring the layer stack options, restore the values to those shown in the image below and click OK to close the dialog. This routing grid is chosen not just to allow tracks to be placed as close as possible and still satisfy the clearance, the PCB editor manages this automatically. The point of setting the grid to be equal to, or a fraction of, the track+clearance, is not just to ensure that the clearance is maintained, it is to ensure tracks are placed so that they do not waste potential routing space, which can easily happen if a very fine grid is used. To open the Cartesian Grid Editor, select Home | Grids and Units | Properties to open the dialog, as shown below. Confirm that the Snap Grid is set to 1 mm, ready to position the components. Press the Ctrl+G shortcut keys to open the Cartesian Grid Editor dialog. Alternatively, open the Cartesian Grid Editor dialog as described above. 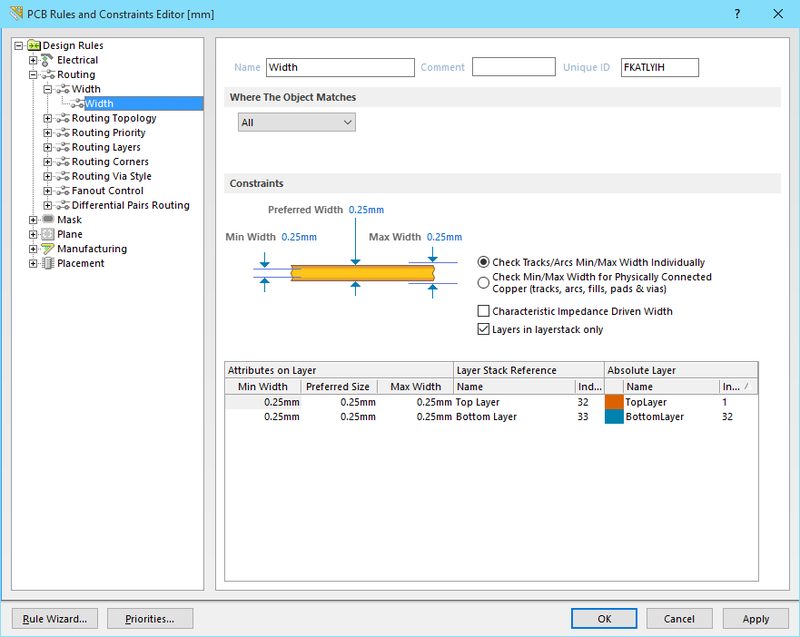 Design rules are configured in the PCB Rules and Constraints Editor dialog, as shown below (Home | Design Rules | Design Rules). The rules fall into 6 categories, which can then be further divided into design rule types. The rules cover electrical, routing, mask, plane, manufacturing and placement requirements. The tutorial design includes a number of signal nets, and two power nets. The default routing width rule (rule scope of All) will be configured at 0.25mm for the signal nets, and a second rule will be added to target the Net Class called PowerNets, as shown in the images below. Two Routing Width design rules have been defined, the lowest priority rule targets All nets, the higher priority rule target objects in the Net Class called PowerNets, which includes the 12V and GND nets. Note that you always remain constrained by the design rules, you are not allowed to enter a value larger or smaller than permitted by the applicable design rule. Avoid using the Min and Max rule settings to define a single rule to suit all sizes required in the entire design, doing this means you forgo the ability to get the software to monitor that each design object is appropriately sized for its task. Since this rule targets the majority of nets in the design (the signal nets), confirm that the Where the Object Matches setting is set to All. The rule is now defined, click OK to save the new rule and close the dialog. The next step is to define a rule that targets the 12V and GND nets. Since they are going to be routed at the same width, you can create a Net Class that includes these 2 nets, and then target the rule to that Net Class. To create a Net Class, click the Home | Design Rules | Classes button to open the Object Class Explorer dialog. In the tree on the left of the dialog, right-click on the Net Classes folder and select Add Class from the menu. A new class is added, ready to be named. Type PowerNets into the name box and press Enter on the keyboard. Now select the 12V and GND nets in the Non-Members list, and click the > button to move them to the Members list. 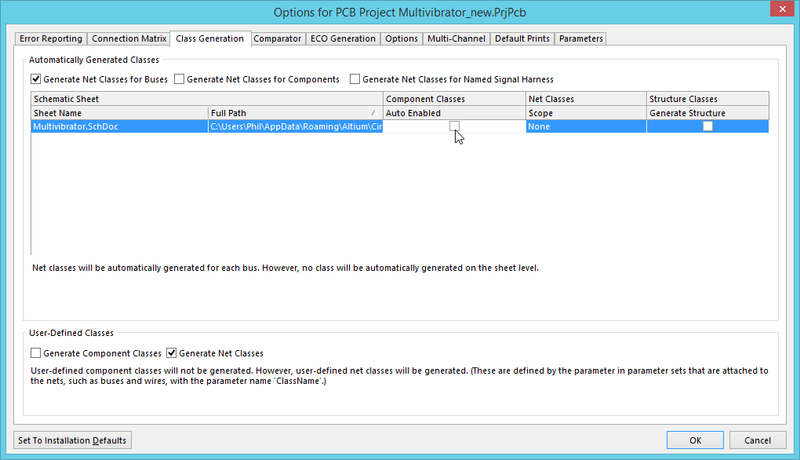 Close the Object Class Explorer dialog and return to the Routing Width section of the PCB Rules and Constraints Editor. Click in the Name field on the right, and enter the name Width_PowerNets in the field. In the Where the Object Matches setting, select Net Class, then choose the PowerNets in the second dropdown, as shown below. This Width rule targets the 12V power net. When there are multiple rules of the same type, the PCB editor uses the rule Priority to ensure the highest priority applicable rule is applied. When a new rule is added it is given the highest priority, when a rule is duplicated the copy is given the priority below the source rule. Click the Priorities button down the bottom of the dialog to change priorities. If you place a via from the Ribbon, its values are defined by the in-built default PCB primitive settings. As you route and change layers a via is automatically added, in this situation the via properties are defined by the applicable Routing Via Style design rule. The next step is to define a suitable default routing via style. Since it is highly likely that the power nets can be routed on a single side of the board, it is not necessary to define a routing via style rule for signal nets and another routing via style rule for power nets. Edit the rule settings to the values suggested earlier in the tutorial, that is a Via Diameter = 1mm and a Via Hole Size = 0.6mm. Set all fields (M in, Max, Preferred) to the same size. Note that you can press Tab on the keyboard to move from one dialog field to the next. You might have noticed that the transistor pads are showing that there is a violation. Don't worry if you don't see any yet - you'll see them soon enough when you perform a Design Rule Check! CircuitMaker's internal defaults for a new board are Imperial. That means when you switch to Metric, settings such as the Soldermask expansion will change from rounded values like 4mil, to values like 0.102mm. While that 0.002mm is insignificant when it comes to output generation, you can edit these settings in the design rules if it bothers you. 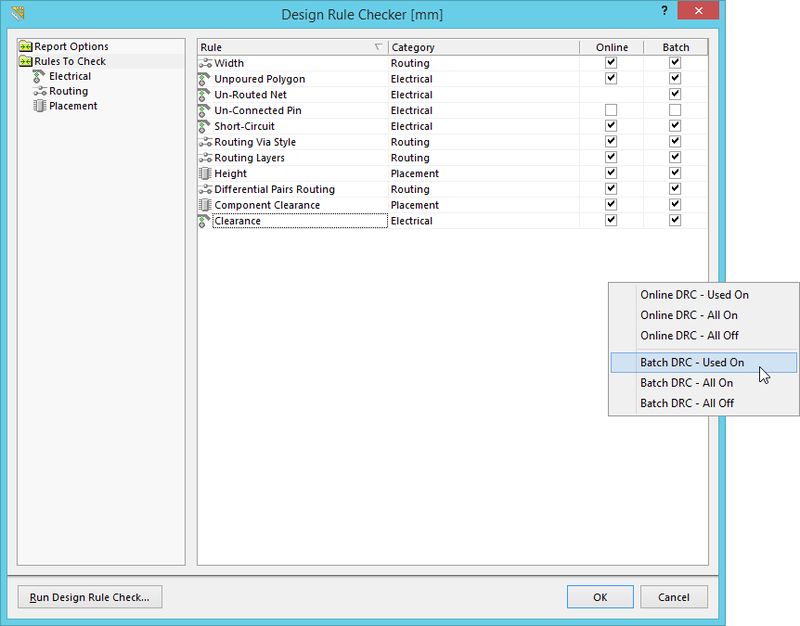 Select Design Rules in the tree on the left of the PCB Rules and Constraints Editor to examine the Attributes of all the rules and quickly locate any that need their values adjusted. There is a saying that PCB design is 90% placement and 10% routing. While you could argue about the percentage of each, it is generally accepted that good component placement is critical for good board design. Keep in mind that you may need to adjust the placement as you route too. The default behavior when moving a component is to hold it by the reference point (Snap to Center) defined in the PCB Library editor, rather than where you happened to click on it. The Smart Component Snap option allows you to override this behavior and snap to the component pad nearest to where you click, handy when you need to position a specific pad in a specific location. Enable Snap to Center to always hold the component by its reference point. Smart Component Snap is helpful when you need to locate by a specific pad. Note the Smart Component Snap option, if this is enabled you can force the software to snap to a pad center instead of the reference point by clicking and holding closer to the required pad than the component's reference point. This is very handy if you require a specific pad to be on a specific grid point. It can work against you if you are working with small surface mount components though, as it can make it harder to "grab" them by their reference point. Run the Tools | Arrange | Move » Component command, then single click to pick up a component, move it to the required location, then click once to place it. Repeat the process for the next component. When you are finished, right-click to drop out of the Move Component command. Select Space Equally in the Horizontal section and Center in the Vertical section, then click OK to apply these changes. The software will first attempt to equally space the four resistors between the first and last selected component. After the components have been spaced you will be prompted to Select a Primitive (check the Status bar), click on the component you want the others to be vertically aligned with. Select, then align and space the resistors. Note that they are not equally spaced because the current 1mm snap grid does not allow it. Stroke - this is a set of 3, simple, built-in fonts that can be reproduced by all photoplotters because they are formed by simple stroke instructions. TrueType - international standard fonts that are provided to CircuitMaker by the Windows operating system. TrueType glyphs are output as region-type objects and are supported by all modern photoplotters. Note that TrueType fonts are not stored in the PCB file, so they must be available on each PC that is used to open the file. In the images shown in this tutorial, the font used for the component designators has been set to Arial with the Height = 1.5mm (for TrueType fonts the width is proportional to the height). You can easily change the properties of all designator string in CircuitMaker, using the PCB Inspector panel. The PCB Inspector panel displays the properties of all selected objects, allowing you to edit them all in a single action. To select all of the designator strings, you can use the PCB Filter panel, which is ideal for quickly locating and examining all objects of a certain type. 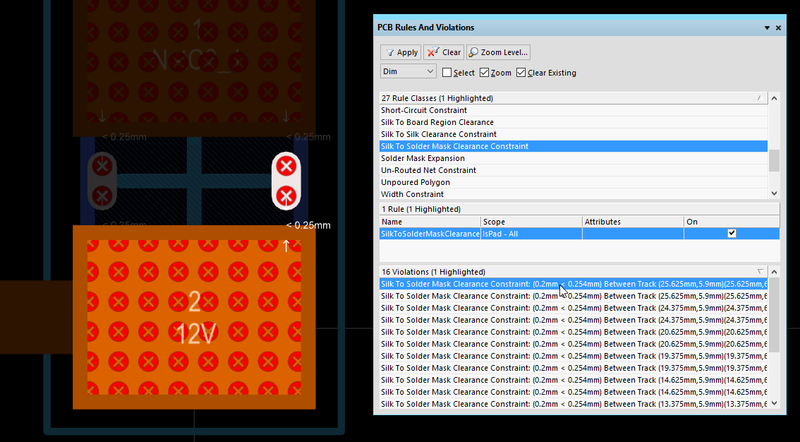 Use the PCB Filter panel to find all component text, then use the PCB Inspector to edit the font properties. From the View ribbon, enable the panel and the panel. In the image below you can see that the PCB Filter panel has been docked on the left, with the PCB Inspector docked on the right. 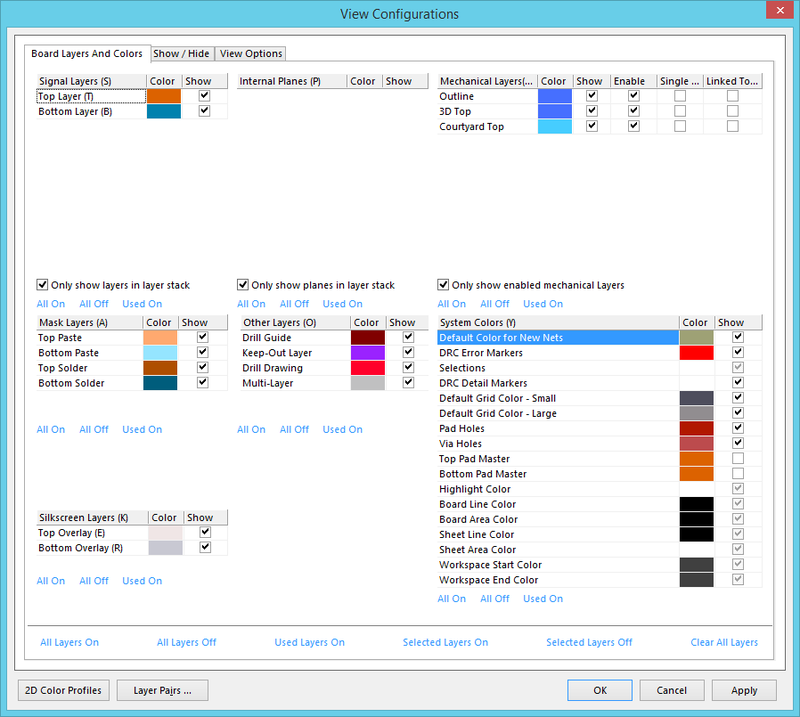 In the PCB Filter panel, select Components in the Groups region, then select Text in the Objects region. Note that everything in the workspace has greyed out, except for the component strings. This is called Masking, as explained in the highlight box below. Click once in the workspace to make it the active area in CircuitMaker, the press the Select All shortcuts, Ctrl+A. Only the text strings will select, this is because all other objects are Masked. 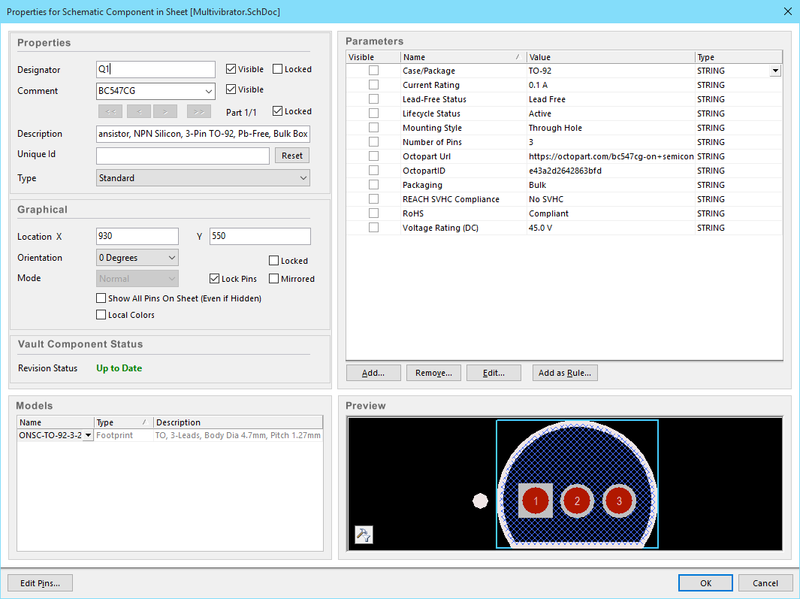 The PCB Inspector panel will show the properties of all selected objects, in the image below you can see that this is the 9 designator strings. At the bottom of the list is the Text Kind, set this to TrueType Font. Set the Text Height to 1.5mm. Confirm that the TrueType Font Name is Arial. All selected text strings will now be Arial, 1.5mm high. Even a simple PCB can result in a busy workspace, where it can be difficult to interpret and understand what you are looking at. CircuitMaker includes two techniques for managing the display of objects in a busy workspace, known as Dimming and Masking. Dim and Mask are display filtering modes, where everything other than the object(s) of interest are faded, leaving only the chosen object(s) at normal display strength. The Dim mode applies the filter but still allows all workspace objects to be edited, the Mask mode filters out all other workspace objects, only allowing the unfiltered object(s) to be edited. Configure the interactive routing options - the highlighted options are important for this tutorial. Set the Snap Grid to a value that is suitable for routing - enter 0.25mm into the Snap Grid control in the Ribbon. A simple animation showing the board being routed, press Spacebar to change the corner direction. Position the cursor over the lower pad on connector Y1. As you move the cursor close to the pad it will automatically snap to the center of the pad - this is the Snap To Object Hotspot feature pulling the cursor to the center of the nearest electrical object (configure the Range of attraction in the Board Options dialog, click Home | Board | Board Options to open the dialog). Sometimes the Snap To Object Hotspot feature pulls the cursor when you don't want it to, in this situation press the Ctrl key to temporarily inhibit this feature. Dull solid - dull segments are proposed but uncommitted, they will be placed when you left-click. When you have routed to the target pad, right-click to release that net while remaining in Interactive Routing mode. There is no single solution to routing a board, and it is inevitable that you will want to change the routing. 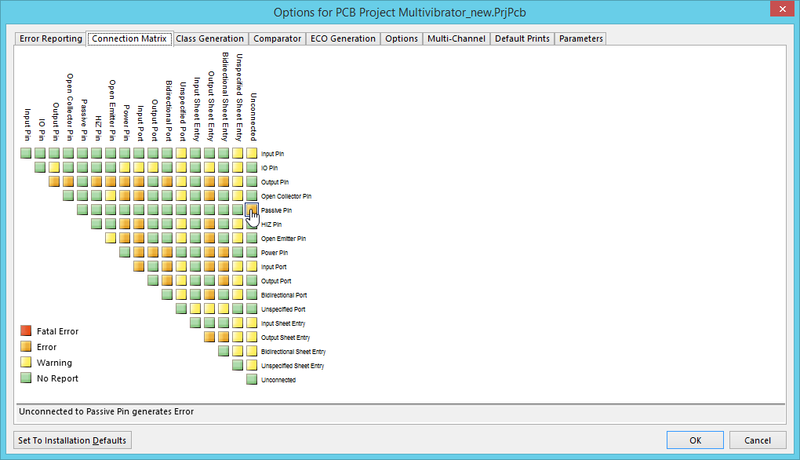 The PCB editor includes features and tools to help with this, they are discussed in the following sections. Save the PCB when you are finished routing. The PCB editor's Interactive Routing engine supports a number of different modes, with each mode helping the designer deal with particular situations. Press the Shift+R shortcut to cycle through the enabled modes as you interactively route, note that the current mode is displayed on the Status bar. To modify an existing route, there are two approaches, you can either: reroute, or re-arrange. During dragging certain routing conflict resolution modes also apply (Ignore, Push), press Shift+R to cycle through the modes as you drag a track segment. 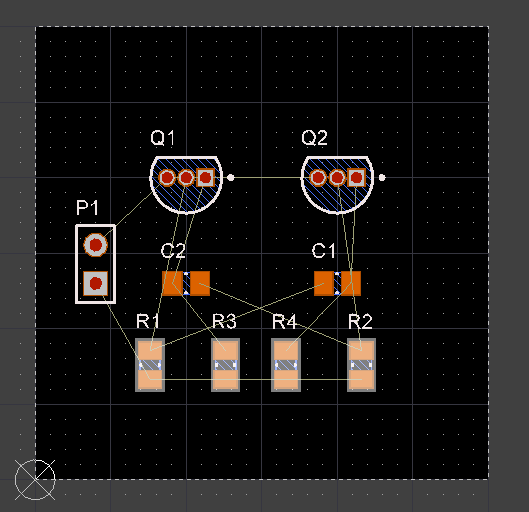 CircuitMaker also includes a topological autorouter. A topological autorouter uses a different method of mapping the routing space - one that is not geometrically constrained. Rather than using workspace coordinate information as a frame of reference (dividing it into a grid), a topological autorouter builds a map using only the relative positions of the obstacles in the space, without reference to their coordinates. 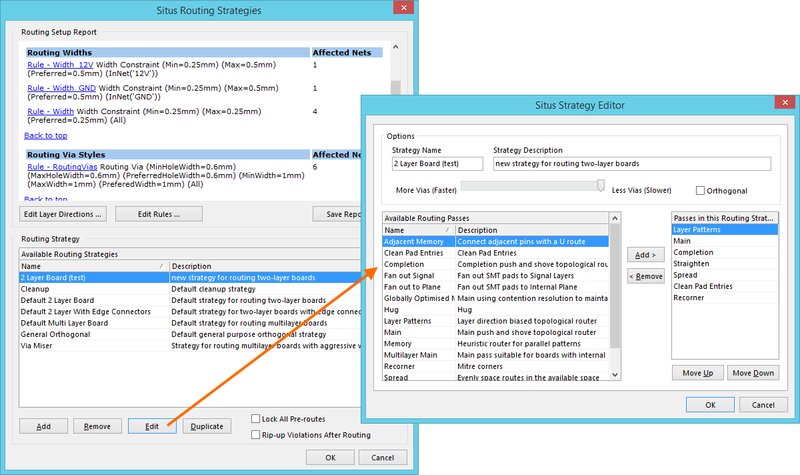 Select an existing routing strategy, or create a new one in the Strategy Editor. The images below show the autorouting results using the Default 2 Layer Board Strategy on the left, and the same strategy but with the bottom layer disabled in the Routing Layers design rule, on the right. Autorouting results for the default 2 layer strategy (left image), and then again with the bottom layer disabled (right image). Time to check and make sure that the design complies with the design requirements defined in the design rules. Violations can be displayed as a colored overlay and also as a detailed message, with different symbols being used at different zoom levels. then right-click again and select Show Violation Overlay - Used, as shown in the dialog image above. The right side of the dialog displays a list of general reporting options, for more information about the options press F1 when the cursor is over the dialog. These options will be left at their defaults. Checking is configured for each rule type, use the right-click menu to toggle multiple options. When the Run Design Rule Check button at the bottom of the dialog is clicked, the DRC will run. Below the summary of violating rules will be specific details about each violation. The links in the report are live, click on an error to jump back to the board and examine that error on the board. Note that the zoom level for this click action is configured in the System - General Settings page of the Preferences dialog, experiment to find a zoom level that suits you. The report details all detected violations, click on a violation to jump back to the PCB and examine the error. When you are new to the software, a long list of violations can initially seem overwhelming. A good approach to managing this is to disable and enable rules in the Design Rule Check dialog, at different stages of the design process. It is not advisable to disable the design rules themselves, just the checking of them. For example, you would always disable the Un-Routed Net check until the board is fully routed. 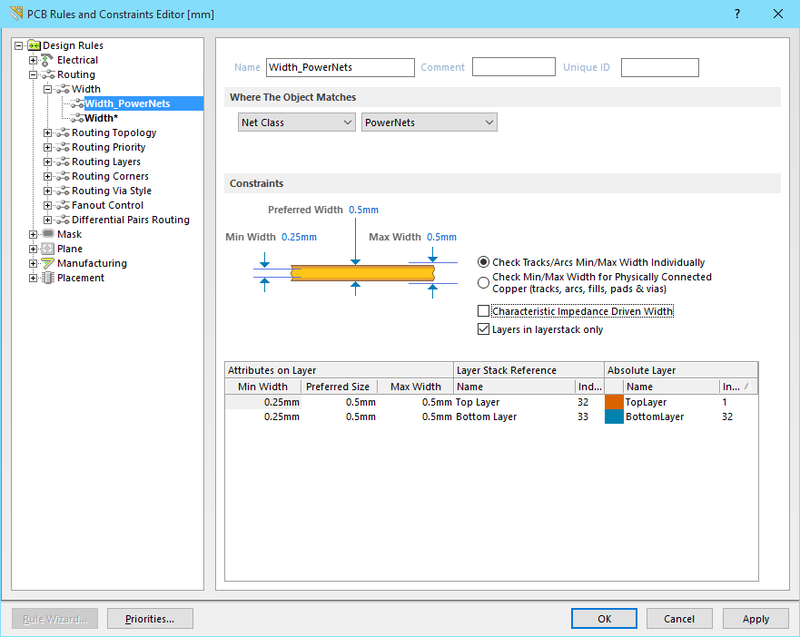 4 clearance constraint violations - which means the measured clearance values are less than the minimum amounts specified in the applicable Clearance Constraint design rule. 16 silk to solder mask clearance violations - which means there are silkscreen objects that are closer to an opening in the solder mask than the distance specified in the Silk to Solder Mask Clearance rule. 6 solder mask sliver violations - which means the smallest width of solder mask between openings in the mask is below the width allowed by the Minimum Solder Mask Sliver design rule. The image below shows the Violation Details for one of the clearance constraint errors, indicated by the white arrows and the 0.25mm text. The next step is to work out what the actual value is so you know how much it has failed by. the PCB Rules and Violations panel. The best approach to locating and understanding design rule violations is to use the PCB Rules and Violations panel. Click the View | PCB | Rules and Violations button to display the panel. To see all violations, scroll the Rule Classes list to the bottom and select [All Rules]. To examine the violations for a specific rule class, select that rule in the Rule Classes list. When you select a specific rule class, all rules defined in that class are listed in the Rules section of the panel. In this middle section of the panel you can: double-click to edit the settings for that rule, right-click » Clear Violations For Rule; right-click » Run DRC Rule to re-run the DRC for just that rule. Click once on a violation in the Violations section of the panel to jump to that violation, or double-click on a violation to open the Violation Details dialog. As the designer you have to work out the most appropriate way of resolving each design rule violation. This solution is acceptable in this situation because the only other component with thruhole pads is the connector, which has pads spaced over 1mm apart. the rule in the PCB Rules and Violations panel. This rule checks the distance from silk screen objects to openings in the solder mask. If you scroll through the violations in the PCB Rules and Violations panel, you will see that they all fail by the same amount, with an actual distance of 0.2mm. Adjust the size and / or location of the silkscreen objects to meet the clearance requirement. 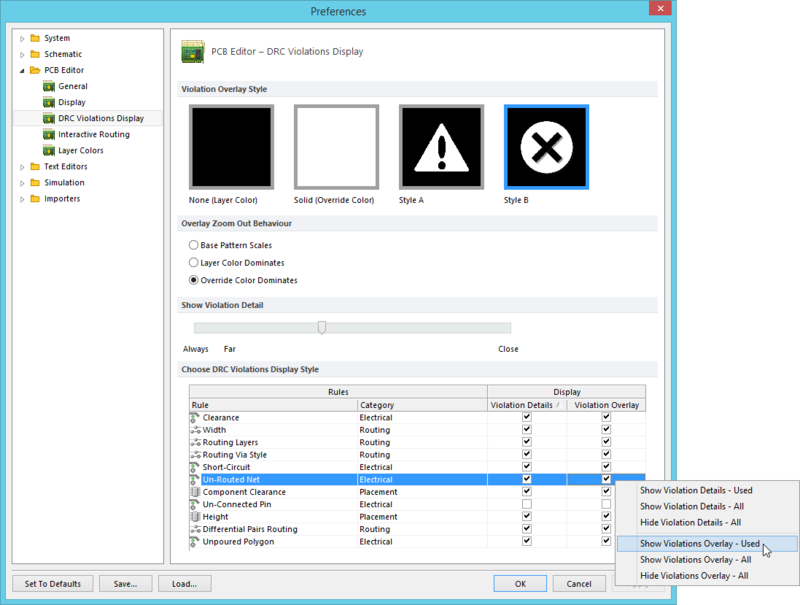 Change the rule setting to allow silkscreen objects to be closer to mask openings. Use the PCB Rules and Violations panel to locate and examine the violation. The default rule value of 0.254mm (10mil) is conservative. Half of the current value would still be an appropriate value for low-cost fabrication. 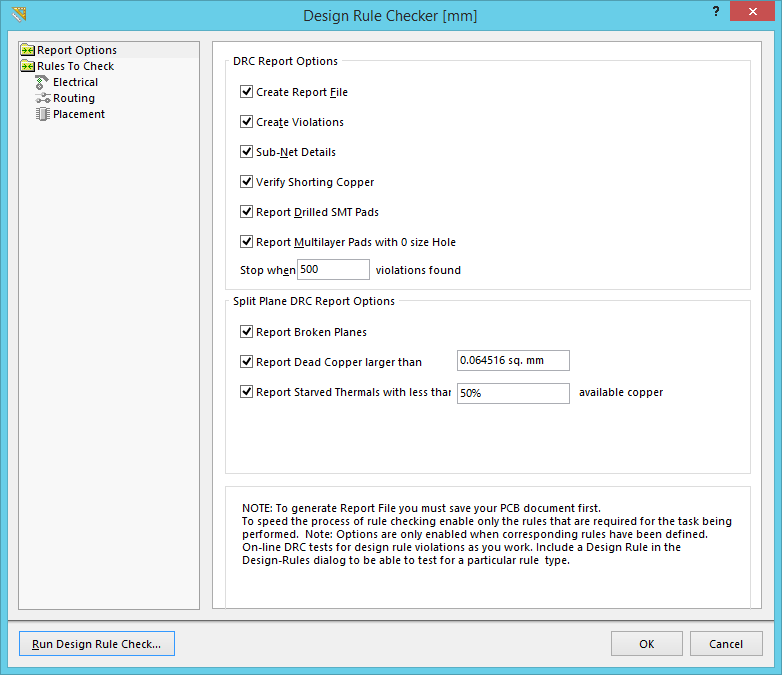 To edit the rule settings, double-click on the SilkToSolderMask rule in the Rule section of the PCB Rules and Violations panel, and change the Silkscreen to Object Minimum Clearance to 0.125mm (5mil), and click OK.
Now right-click on the rule in the PCB Rules and Violations panel and select Run DRC Rule (SilkToSolderMask). The violations that were present for this rule should clear. Edit the rule clearance to be 0.125mm. The transistors and capacitors are failing the Solder Mask Sliver Constraint. How you resolve this is a design decision which would be made in light of your knowledge of the component, and the fabrication and assembly technology being used. Opening the mask to completely remove the mask between the transistor and capacitor pads means that there is more chance of creating solder bridges between those pads, whereas decreasing the mask opening will still leave a sliver which may or may not be acceptable, and will also introduce the possibility of mask-to-pad registration problems. 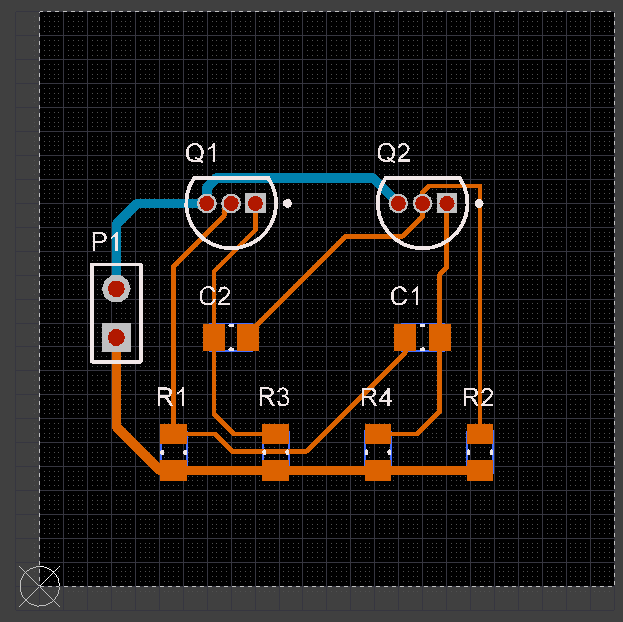 For this tutorial the best approach is to do a combination of the second and third options - decreasing the minimum sliver width to a value suitable for the settings being used on this board, and also decreasing the mask expansion, but only for the transistor pads. The first step is to reduce the allowable sliver width. 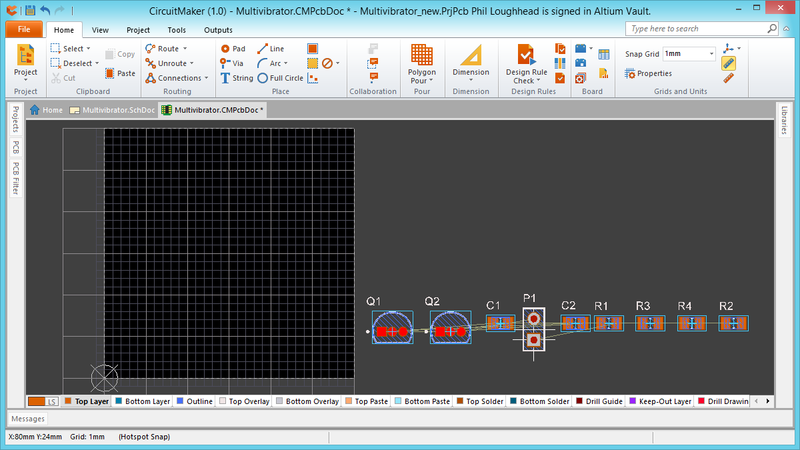 To do this, open the PCB Rules and Constraints Editor dialog, then in the Manufacturing section locate and select the existing Minimum Solder Mask Sliver rule, called MinimumSolderMaskSliver. A value of 0.125mm (5mil) should be acceptable for a design such as this, edit the Minimum Solder Mask Sliver value to 0.125mm in the Constraints region of the rule. The second step is to reduce the solder mask expansion. This will require 2 rules, one targeting the transistors, the other targeting the capacitors. Click on the Mask section in the tree on the left of the dialog to show the current Solder Mask Expansion rules, there should be one called SolderMaskExpansion. Click on it to select the rule and display its settings, the default rule has an expansion value of 0.102mm (4mil). This rule will be left as a general rule for the entire board, you will create 2 new rules for the transistors and capacitors. 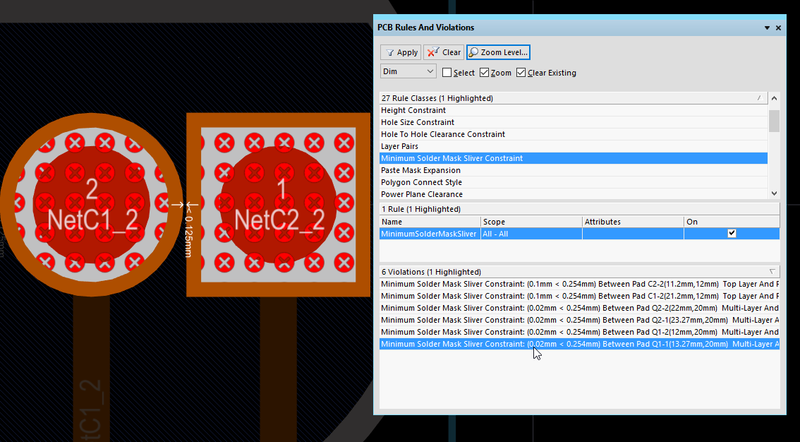 To add a new Solder Mask Expansion rule, right-click on the current rule and select New Rule. A new rule called SolderMaskExpansion_1 will be created, click on it to display its settings. Two rules have been added to reduce the solder mask expansion to zero for the transistors and capacitors. To confirm that all violations have been resolved run another Design Rule Check, with the Create Report File option enabled. Doing this means you have a record of which rules were checked, the rule settings, and the fact that there were no failures. 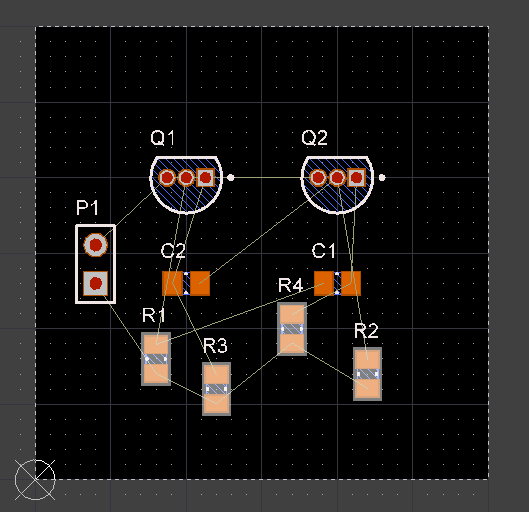 A powerful feature of CircuitMaker is the ability to view your board as a 3 dimensional object. To switch to 3D, click the Switch to 3D button (View | View group), or press the 3 shortcut. The board will display as a 3 dimensional object - the tutorial board is shown below. You can import a 3D STEP-format model into the component footprint editor - place a 3D Body Object then select the Generic STEP Model type to embed a STEP model inside that 3D Body Object. If there is no suitable STEP model available, create your own component shape by placing multiple 3D Body Objects in the footprint editor. Now that you've completed the design and layout of the PCB, you're ready to produce the output files needed to get the board reviewed, fabricated and assembled. To learn more about setting up an output, open the dialog and press F1. If you were using an individual output and then switched to Managed Release you will notice that the setup dialogs are the same. Although the dialogs for each output type are the same, the settings are separate and must be configured again if you switch from one approach to the other. The Generate Output Files dialog can be opened at any time, with a schematic open, a PCB open, or no document open - click the button on the Project tab to open the dialog. Note that when you open the dialog, the special file that holds the output settings is automatically created in the project folder, so the project file will now be marked as modified. The smallest unit used on the board is 0.25mm for the routing and clearance, but because most of the components have their reference point at their geometric center (and were placed on a 1mm grid), some of their pads will actually be on a 0.01 grid. Set the Format to 4:3 on the General tab, this ensures that the resolution of the output data is adequate to cover these grid locations. Note: the NC drill file must always be configured to use the same Units and Format. Switch to the Layers tab, then click the Plot Layers button and select Used On. Note that mechanical layers may be enabled, but these are not normally Gerbered on their own. Instead they are often included if they hold detail that is required on other layers, for example an alignment location marker that is required on every Gerber file. In this case the Mechanical Layer options on the right side of the dialog are used to include that detail with another layer. Disable any mechanical layers that were enabled in the Layers to Plot section of the dialog. Back in the Generate Output Files dialog, enable the Gerber Files checkbox so that the Gerber Files will be created when the Generate button is clicked (after the BoM is configured). CircuitMaker includes a highly configurable BoM generation feature which can generate output in a variety of formats, including: text, CSV, PDF, HTML and Excel. Excel-format BoM's can also have a template applied using one of the pre-defined templates, or one of your own. BoM output is configured in the Bill of Materials For Project dialog, which you access via the Generate Output Files dialog. The BoM generator sources its information from the schematic, enable the Include Parameters from PCB option to access PCB information, such as location and side of board. Using this, you can also generate output such as a user-configured pick and place file, if required. Design data can be passed from CircuitMaker into an Excel Bill Of Materials, by including special statements in the Excel template used to create the BOM. Explore the sample Excel templates in the \CircuitMaker\Templates folder. Note that Fields need to be defined above or below the Column region of the template. Generate all of the outputs configured in the Generate Output Files dialog, which are added to a single release ZIP file. Take a snapshot of the design files that the release was generated from, and add these to the release ZIP file. Upload this to the Community Vault, where it is stored. For any project stored in the Community Vault, available releases can be downloaded from the Home view. Locate the project of interest then click Releases to access the Download Files, as shown below. The released ZIP file can be downloaded from the Community Vault at any time, either from within CircuitMaker or via the CircuitMaker community website. To learn more about Releases, refer to the Project Management in CircuitMaker article.